Cactus Car Wash in Marietta (where Doug takes his cars for hand washing), has extended all our members a special offer - $5.00 OFF for showing their Peach State CLC membership card. So, make sure you have a PSCLC membership card in your wallet and visit Cactus Car Wash (Marietta) to make your Cadillac shine! Lee and Mary Jean Dunn were just notified that 'Goldilocks' has been selected for October in the 2019 Cadillac LaSalle calendar! 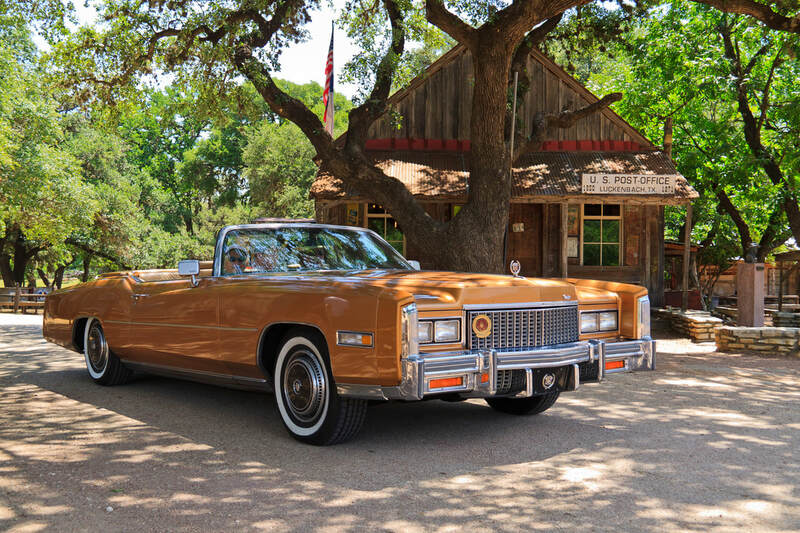 Their 1976 Cadillac Fleetwood Eldorado convertible looks splendid in Amberlite Firemist exterior color, while the interior and top (not shown) are Buckskin leather. The photograph, below, was taken in Luckenbach, TX on the Texas Hill Country driving tour during the 2018 CLC Grand National. We will include a link once the 2019 calendars are available. Congratulations Lee & Mary Jean! We just won the 2018 National CLC Webmaster Award! Congratulations to all who have contributed their news, photos, articles and event information over the past years. We wouldn't have a robust website without all your contributions! And special Kudos to our Editor-in-chief, Doug Bailey, and Webmaster, Sandy Barth! 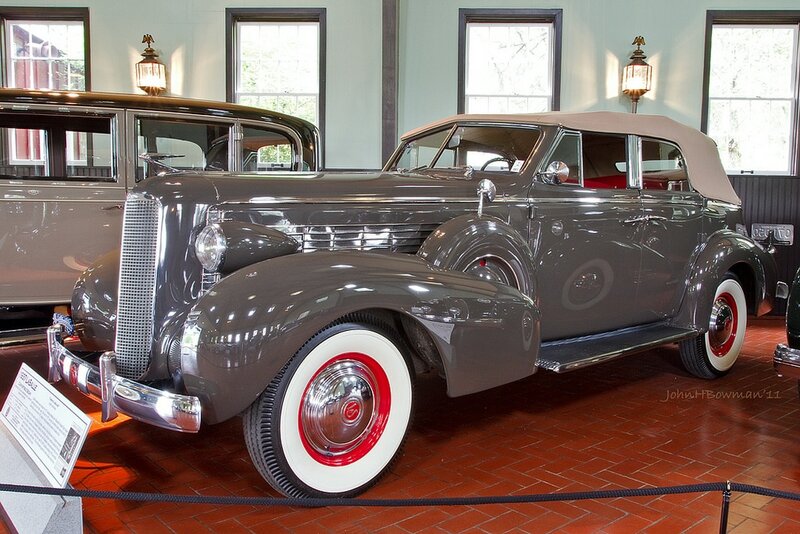 their beautiful Cadillacs appeared in Hemmings Motor News! 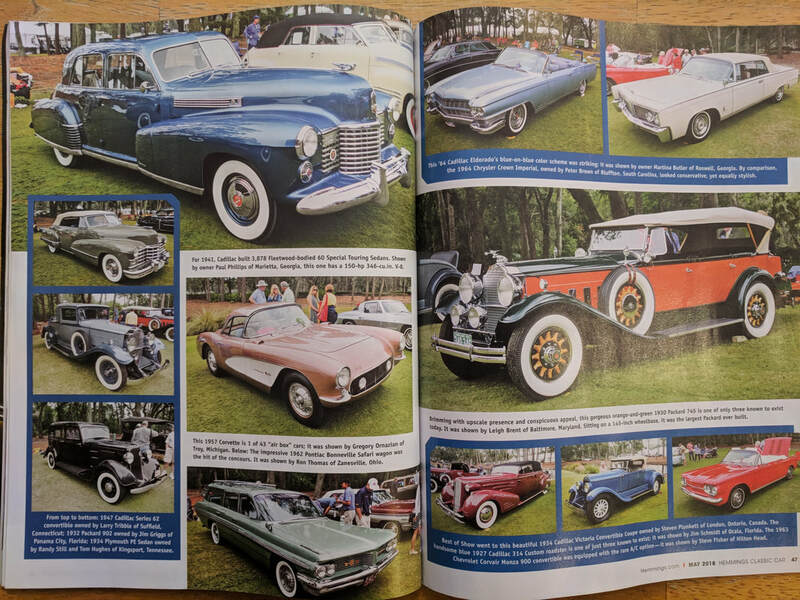 Martina's 1964 Eldorado is on right page; top left — both WINNERS at the 2017 Hilton Head Concours! The first weekend is over and as far as I know all cars were present for their display time. Thanks to all for participating in this event. I personally found the presentation of Driving Miss Daisy by the Cherokee Theatre Company to be very well done. The acting, set design, lighting, sound, etc. were all of a high caliber and our cars add an interesting flavor for the theater-goers. 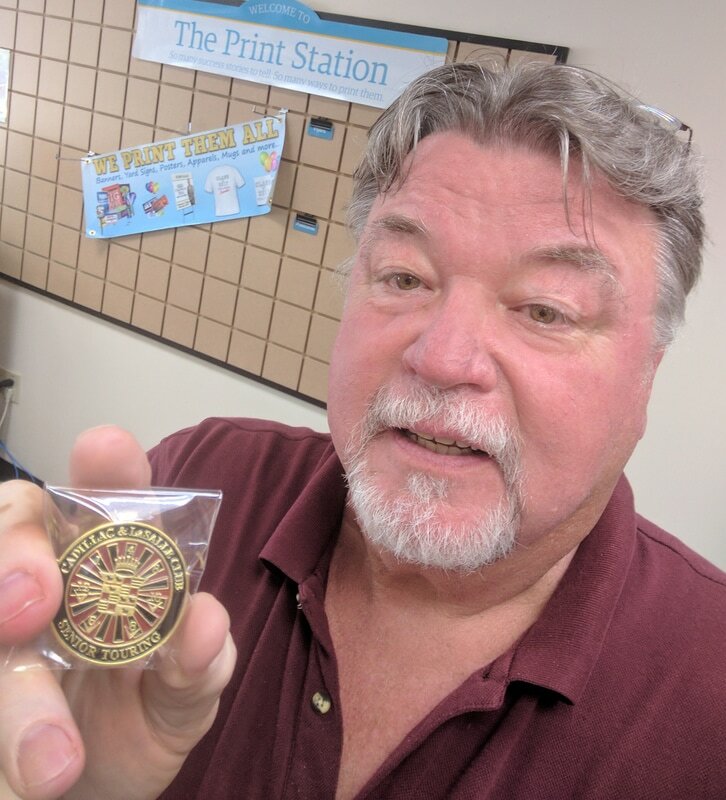 For those of you that do not subscribe to the Cherokee Tribune newspaper, their issue last Wednesday had a 2/3 page article on Driving Miss Daisy accompanied by 4 photos of the cast and classic cars along with a head line on the front page. I'll attach a copy. This coming weekend we have 6 more classic cars to be present in front of the theatre. Your tickets are at the ticket window facing the sidewalk, just identify yourself as providing a classic car and your name. If anyone has photos of their display I would appreciate receiving some. Driving Miss Daisy stage production in Canton - Needs Classic Cars! The beautiful refurbished Canton Theatre on Main Street in historic downtown Canton, GA will host a stage production of "Driving Miss Daisy" for six days in March. Peach State member Lee Dunn is working with the Theatre’s director to display classic cars from the 1930's through the 1960's in front of the theatre during each show. All owners of displayed cars will be provided with two tickets to that day’s stage production. We could use up to six (6) per day. Owners may display on more than one day if you wish. Cars must be in position at least one hour before each performance, and remain in place for half an hour following the performance. If you know of other friends that would have an appropriate car, please pass this email to them. Thank you. As you know, the first Touring Miles award is for 500 miles in a car at least 10 years old. The award goes to the car, and stays with the car, regardless of owner. You can register sanctioned touring miles on a newer car, but you won’t qualify until your car is ten years old. Stephen Page, the CLC volunteer who coordinates this program, is tracking cars and owners by their CLC member numbers and vehicle ID (VIN) numbers. At 2,000 sanctioned miles a car earns its Senior Touring award. This is a glossy black sticker that mounts on the regular touring badge, indicating Senior Touring with two merlettes. If you need a definition of a merlette, give me a call. You also get a lapel pin that goes well on a hat if you don’t wear lapels (see photos, below). I submitted the mileage forms for Kelly, Dunn (I added your VIN), Smith and Bailey. Bibb has submitted his directly to Stephen Page, and O’Neills are working on theirs. · Bailey’s Eldorado has already earned its 500-mile touring badge. With this 250-mile trip the Eldo is still almost 600 miles short of the Senior Touring award. That’s going to take another year or more of touring in this car. · Dunn’s Eldorado (CLC Touring badge #1, and DeCou award winner) had accumulated 1,577 miles prior to the Macon tour. With those 250 miles, the Eldo tallies 1,827 sanctioned miles. Lee, you ought to earn your Senior Touring award on your next sanctioned tour in Goldilocks. · Kelly’s ’91 Allante had accumulated 993 miles prior to Macon. With those 250 miles he’s now at 1,043 – still a good ways away from the Senior Touring award. Question is, how are you going to rack up enough Allante miles once you start driving that ’68 you’re finishing now, Lewis? · O’Neill’s Biarritz will be entering the program for the first time this spring as I understand it. Hang in there, you’ll have that 500-mile badge in November if you go with us to Hilton Head Island! 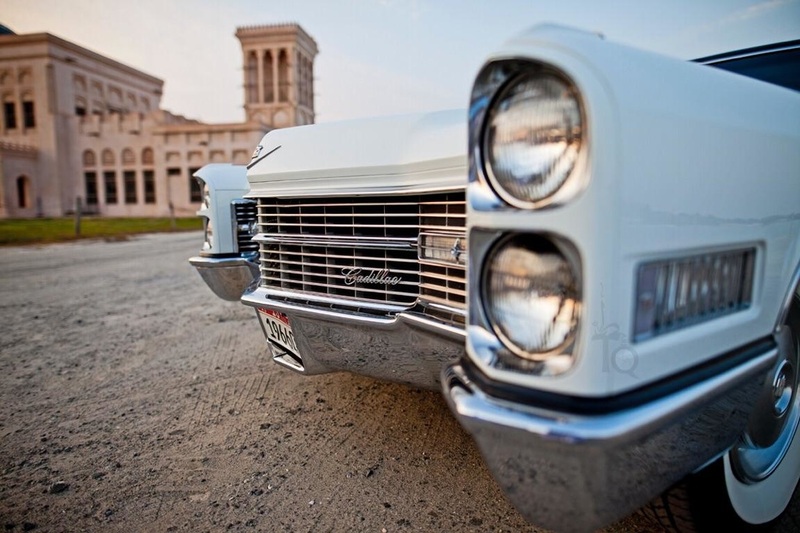 · Bibb’s and Smith’s Cadillacs aren’t old enough yet, but keep registering those miles! · Friedman’s ’49 has piled up a ton of touring miles, but I don’t see it among the registered cars for the official touring program. You might say this program is for novices ASPIRING to be like Jay – who drives his car literally EVERYWHERE. I didn’t look into any cars that didn’t go with us to Macon. For them, nothing has changed since they last registered miles. Let me know if you have questions by CLICKING HERE. 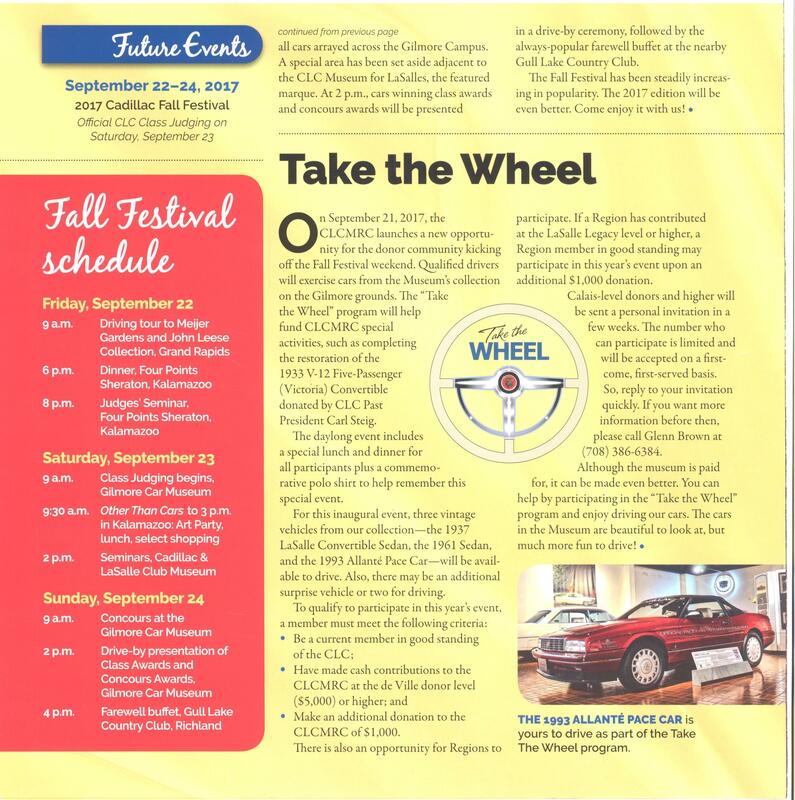 Thinking about heading up to Gilmore, MI for the 2017 Cadillac Fall Festival? (like the 1937 LaSalle Convertible on the right)! at Keels & Wheels in Houston, TX! The National CLC recently implemented a membership renewal program called “Your Membership.” It’s a software solution for regional affiliates. With the new software, CLC members with email addresses on file at CLC will receive CLC membership renewal notifications via email instead of U.S. mail – just like you have had for years with Peach State CLC renewals! The new approach for the national club went into effect in March 2017. CLICK HERE to see an example of the national membership renewal email notification that national CLC members will now receive. Online: cadillaclasalleclub.org - the best way! Mail: Print and return a membership application. If members renew Online by clicking to the club's website, it will direct them to log in to their account in Your Membership where they can pay by PayPal or credit card. The Log-in User Name will be provided in the national membership renewal notification email. (It’s typically a member's email address.) If a password needs to be reset, select the hyperlink that says to click here to reset your password. If members choose Mail by clicking the link for membership application, it will direct them to a PDF of the national membership form that is posted on the website that can be downloaded, completed and U.S. mailed to the national CLC office in Columbus, OH along with dues payment. If members choose Phone, they can call the national CLC office in Columbus, OH and pay by credit card over the phone. If you suspect that your national CLC membership has expired in the past few months (e.g. haven't received the latest issues of The Self-Starter magazine), please check your email for an email like the one attached. To renew, please follow the options in the email, or log in to your account at cadillaclasalleclub.org and follow the steps or call the national CLC office. If you have any questions, feel free to reach out to me, Mark Nichols, Lucille O’Neill, or any Peach State CLC board member. As always, you will have to keep up with your NATIONAL CLC dues separately from your REGIONAL PEACH STATE dues. We want it that way, because there are “down sides” to having the national club collect our regional dues. I can explain if you like. PS. Thanks to Vince Taliano of the CLC Potomac Region, who crafted most of this message! 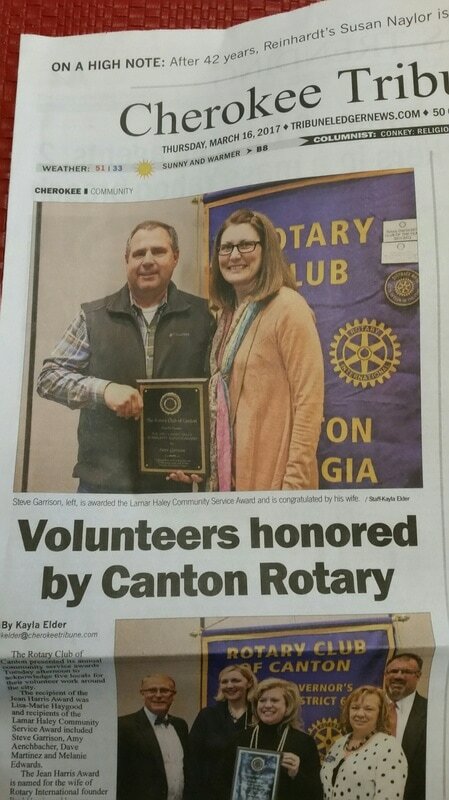 Congratulations to Steve Garrison on being honored by the Canton Rotary Club for his great volunteer efforts! Thanks to Ron Zahn for all the great images and to Martina Butler for her excellent reporting on CLC's Board Meeting! READ ABOUT CLC'S WINTER BOARD MEETING! We've got a great event coming up March 23rd! A Day Tour of the Georgia Governor’s Mansion, the historic Swann House, and luncheon at the fabulous Swan Coach House restaurant. Check out this flyer for details. 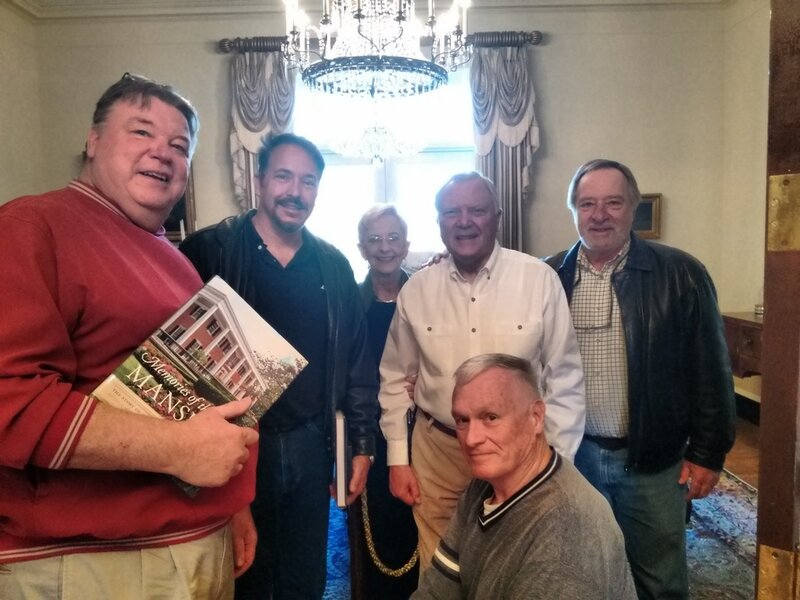 BTW - Our fearless leaders took a field trip to check out some of the details and ran into the top man himself, Governor Nathan Deal! New PSCLC members, Glenn and Debbie Novak, recently attended the Hilton Head Island Concours and shared their photos. "Not a lot of Caddys, but the ones there were about as good as they get," says Glenn. Peach State CLC’s own MARTINA BUTLER – world traveler, gourmet and Cadillac aficionado – once again represented our region at the recent International gathering of CLC brass. As you will see, Martina had to take a hiatus from ocean cruises and European wine tours to make her way into the upper Midwest. What a slog! 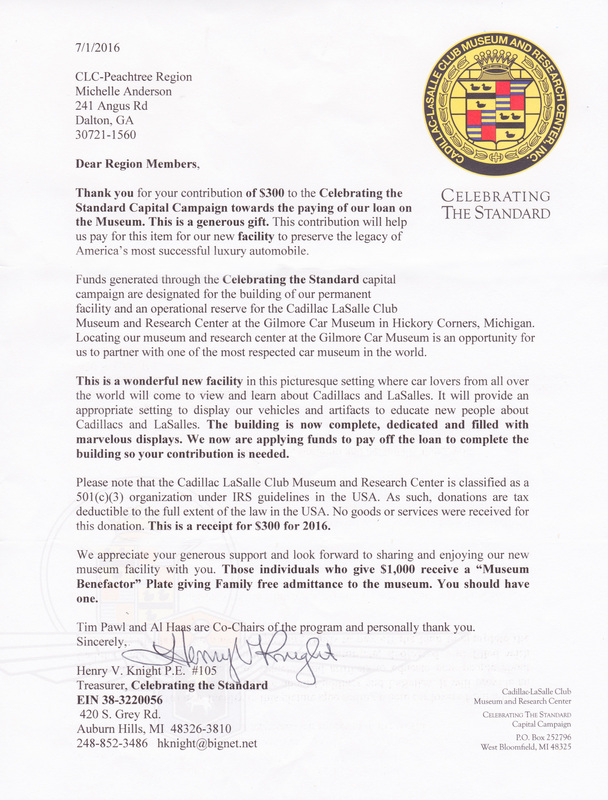 But let’s not get carried away with pity for Martina – she had a wonderful visit at the Cadillac & LaSalle Club’s Museum & Research Center, while browsing the CLC Fall Festival (and copping a ride or two, I dare say). 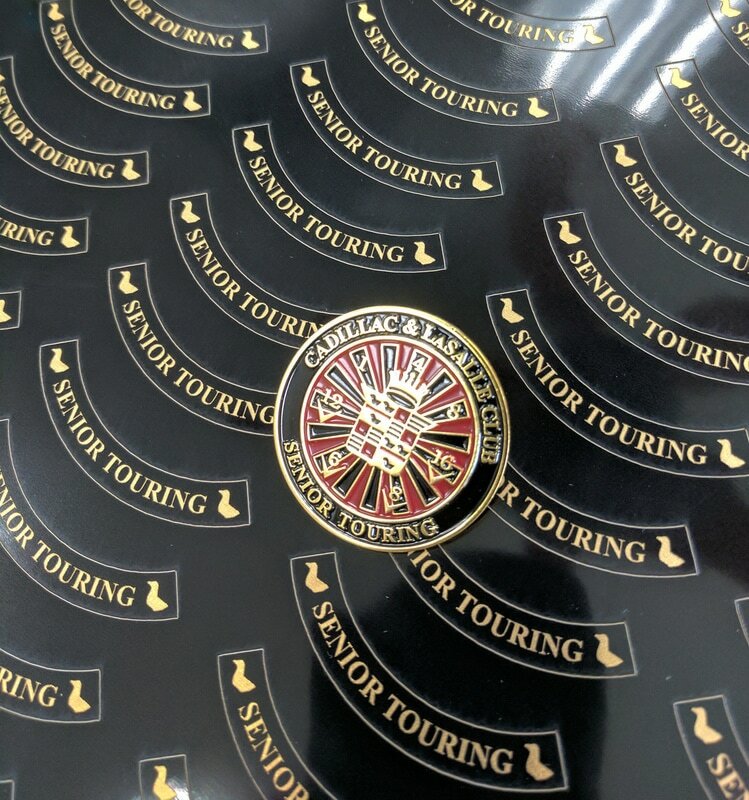 Take a moment to catch up on the CLC’s long term plans for automating membership tracking, and future locations of Grand Nationals and Driving Tours. Martina has even supplied a couple nice photos of our friends in the Midwest! AS A BONUS... Our good friend Ron Zahn, of Oregon, is the CLC’s International VP. Ron has supplied a 600+ photo tour to go with Martina’s write-up. So, if you have a couple of hours to browse, CLICK HERE TO CHECK THEM OUT! 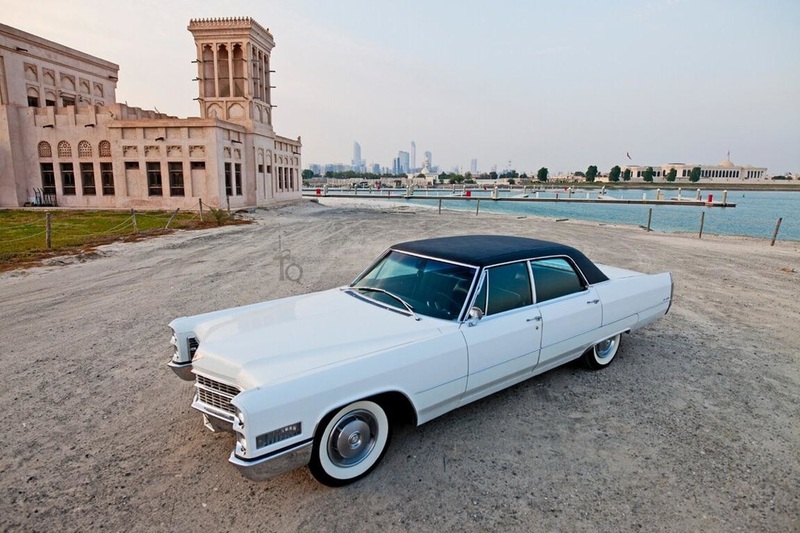 Doug's '66 Cadillac - sold to a customer in Abu Dhabi. It will be featured in a magazine this fall. Check out the short video demonstrating extreme detailing done in the Middle East. PSCLC donated $300 to the national Cadillac LaSalle Club Museum and Research Center recently. We received this gracious letter back from them. Thanks for your support of this unique and a special thanks to Michelle Anderson for coordinating! Click here to view larger version of the letter.